Last week, the weather here was positively fall-like. Then, this weekend, suddenly it is summer again. But, I just couldn’t wait until it cooled off again to make this side. Seriously, I think I could eat it everyday and be just as happy as a clam. Even my kids like it (yeah, they eat Brussels Sprouts, but only if I make them like this). As with most of my recipes, feel free to adjust to your liking. If the kids weren’t around, I would have definitely added some chile flake to this and I might add some red chile powder next time anyway – just for fun. Start out by peeling and cubing one butternut squash. Then trim and halve about 30 brussels sprouts. Toss those with about a tablespoon of olive oil and a sprinkling of salt and pepper (I wish I could tell you how much, but I don’t measure it, just sprinkle it over until it feels right. Besides, your taste and mine are probably different when it comes to how much salt is enough). When your butternut squash and brussels sprouts have been in the oven 20 minutes, pull them out and stir in the pecan/dried cranberry mixture. Put it all back in the oven for another 10 minutes (and try not to drool). When you pull it out, it will look like this and smell like heaven. Seriously! Who wouldn’t want a big ole serving of that deliciousness?!?! I served mine with pan seared pork chops tonight, but it is equally delicious with chicken – or all by itself (you know you thought about it). Bonus points if you can find the pork chop on this plate. Toss butternut squash and brussels sprouts with 1 tablespoon olive oil and salt and pepper. Spread in even layer on a cookie sheet and roast for 20 minutes. While squash and brussels sprouts are in the oven, sweat onion and garlic in remaining tablespoon olive oil over very low heat. When onions are soft and translucent, stir in pecans and dried cranberries. Remove squash and brussels sprouts from oven. Stir in pecan mixture. Spread into an even layer and return to oven. Roast 10 minutes more. 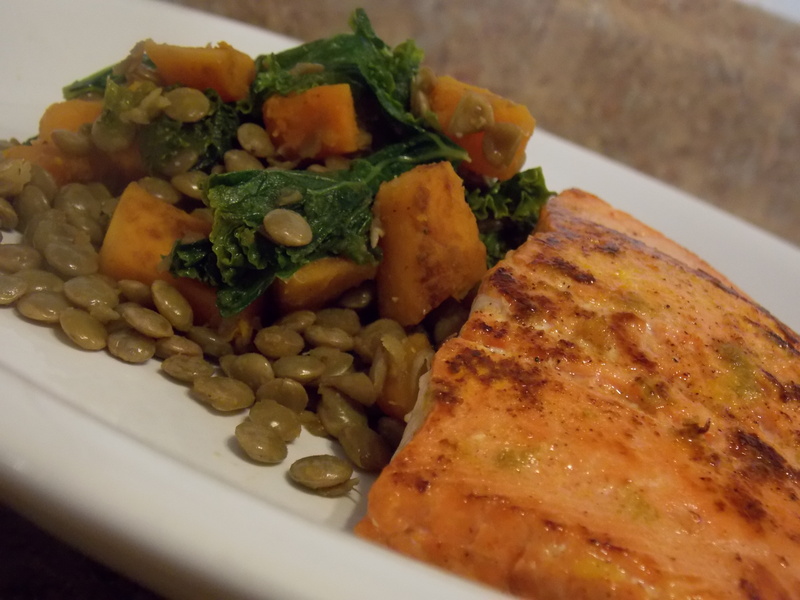 Remove from oven and serve with your favorite protein! Things have been more than a little hectic here. My husband switched jobs and I have been adjusting to life with him on the road. We are settling into a bit of a routine now, so hopefully I will be back to posting regularly. I figured since I’ve been gone for a while I owed you guys a remarkable recipe. This side dish is simple and tasty. And, it’s good for you too. When we go out to eat, if they’re on the menu, we almost always order fried green beans as an appetizer. My enjoyment of the crunchy delicacy is always overshadowed by my brain reminding me how expensive they are and how I could do it better. So, I did. First, set up an reading station. I used coconut flour to keep these grain-free, but you could use all purpose flour no problem. Then egg whisked with a little milk. Then, grated Parmesan cheese seasoned with a little garlic powder, onion powder and paprika. I used frozen green beans (I recently bought 28 POUNDS through my Bountiful Baskets co-op, so I’ve got plenty in the freezer), but this would work just as well (if not better) with fresh. 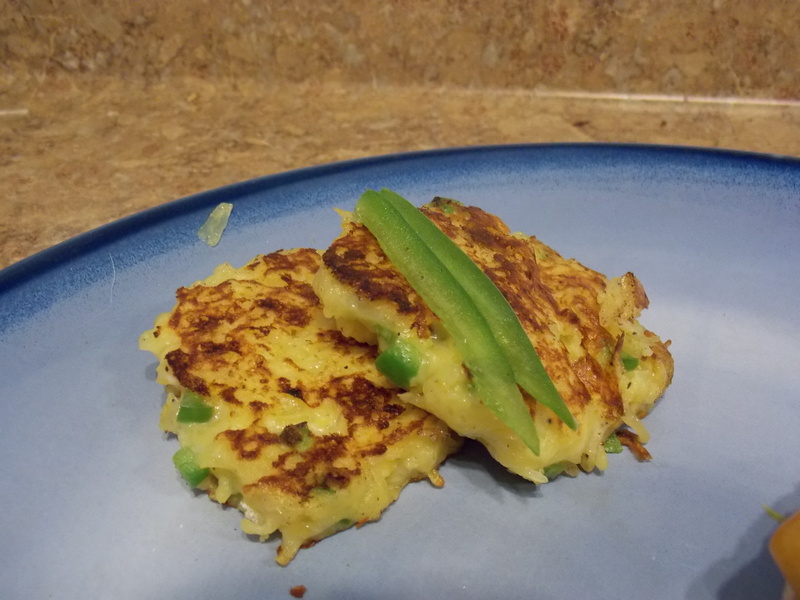 Toss your green beans in the coconut flour, then dip in the egg. 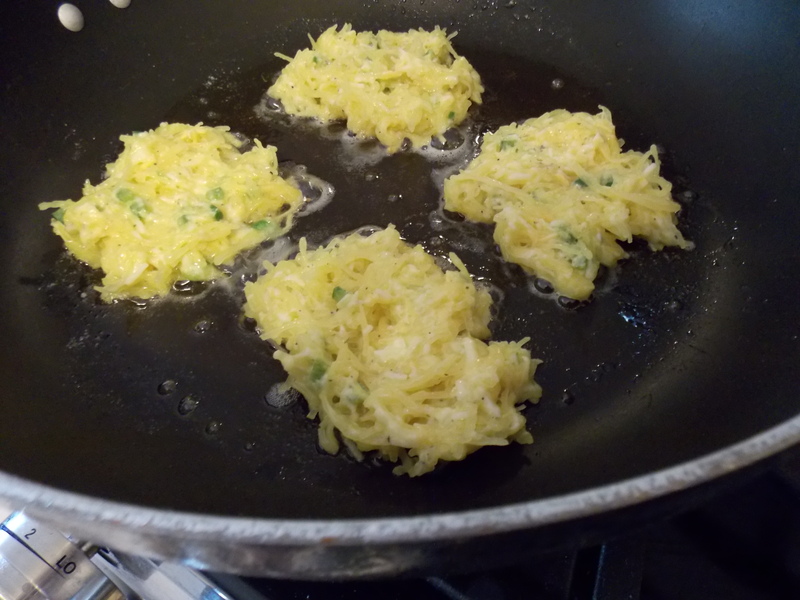 Let the extra egg drop off and roll them in the grated Parmesan. Then, place in a single layer on a baking sheet. Repeat until you run out of green beans or a breading element. Bake at 350* for 10-12 minutes or until golden brown. You may want to flip them after the first 5 minutes. I didn’t and the bottoms got very browned, so that’s up to you. Place coconut flour in a shallow dish. In a separate shallow dish, beat the egg and milk until well combined. In a third dish, stir together Parmesan cheese and spices. Working with a few green beans at a time, coat with coconut flour. Shake off excess and dip into egg. Let excess drain and roll in cheese mixture. Place in a single layer on a baking sheet. Bake at 350* for 10-12 minutes or until golden brown. Flip once during cooking if desired. When I logged in today, I realized that my last recipe was chicken noodle soup. It is insanely appropriate that I posted the classic feel-better recipe last Monday morning, because that afternoon, the cold hit my house hard. And not just any cold. I’ve dubbed this the death cold of 2015. Even a week later my head is stuffy and pounding and there is a noticeable ringing in my ears. I’ve been slipping chile into everything my family eats lately just to be sure that we kill this monster germ DEAD. I’m glad to say that I’m feeling well enough to be sitting in front of the computer screen today and can therefore share this super-simple sweet potato recipe. Start by peeling two medium sized sweet potatoes. Then, slice them into 1/4″ thick rounds. You’re going to want to use a sharp knife and be careful during this step. 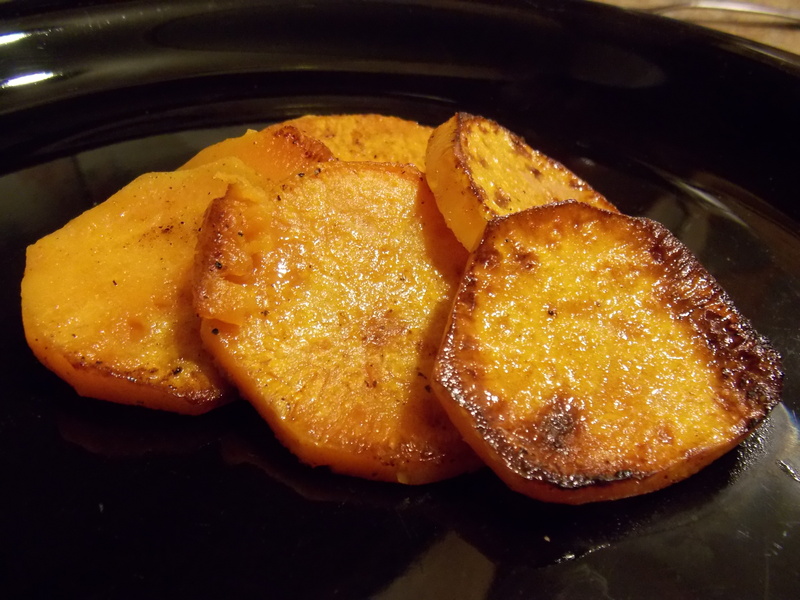 Sweet potatoes are much harder than other potatoes and these do not taste as good with a side of finger. Just sayin’. Now, heat a tablespoon of butter in a non-stick skillet over medium-low heat. When the butter is melted and starts to bubble, layer your sweet potatoes across the bottom. I like to separate them and lay them in a layer at a time. Season with salt, pepper, chile powder and onion powder between each layer. 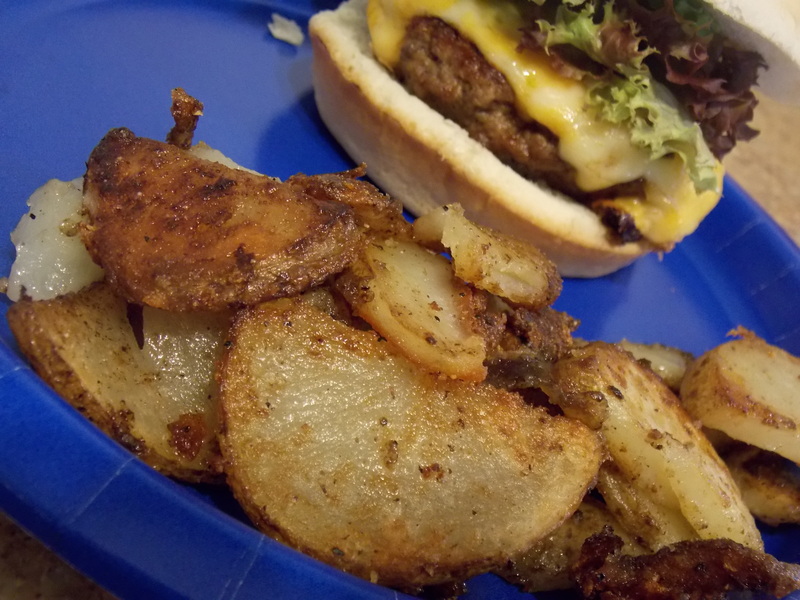 The picture only shows one layer, but I keep layering until I am out of potatoes. When you have all the potato slices layered in the pan, cover wit ha tight fitting lid and cook for 10-15 minutes. I actually don’t have a lid for my non-stick skillet, but my pizza pan is a perfect fit and comes in handy for the next step. I do not have photographs of the flipping step, and it can be a little intimidating. Don’t fear, you can just use a spatula to flip these over a section at a time. They won’t be quite as pretty, but they will taste just as good. If you’re feeling adventurous, give this a try. Take a flat tray (I use my pizza pan) that is large enough to completely cover the top of your skillet. Use hot pads or oven mitts or other heat-protective gear to grab the skillet and the tray together. Hold the tray and skillet tightly together and invert. The potatoes will fall onto the tray. Remove the skillet from the top and place it back on the heat. Slide the potatoes off the tray and back into the skillet so that the cooked side is facing up. Cook over low heat until the bottom is golden brown. I’ve served this in slices before or just a scoop. The top and bottom will be a beautiful golden brown and the inside will be soft and creamy. You can see where the potatoes with direct skillet contact are caramelized and the inside ones are more pale. 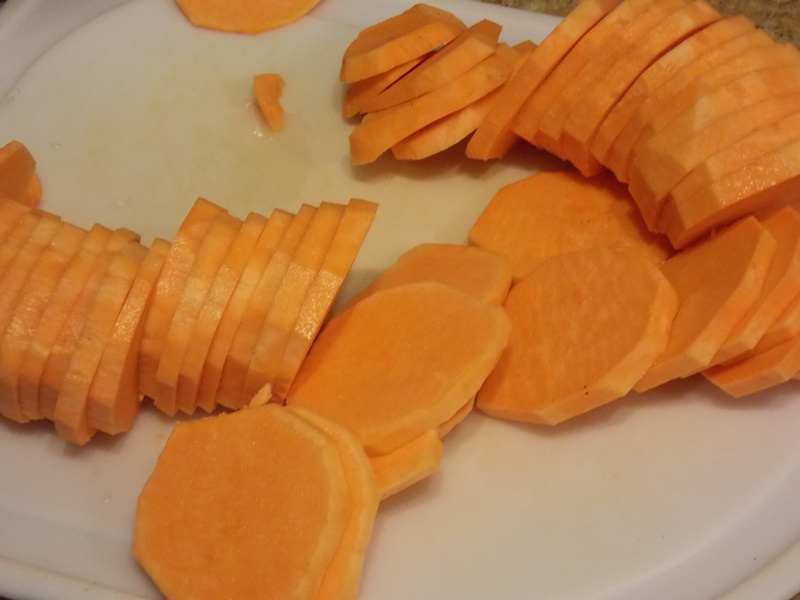 Peel sweet potatoes and slice into 1/4″ rounds. Heat oil in a large non-stick skillet over low heat. 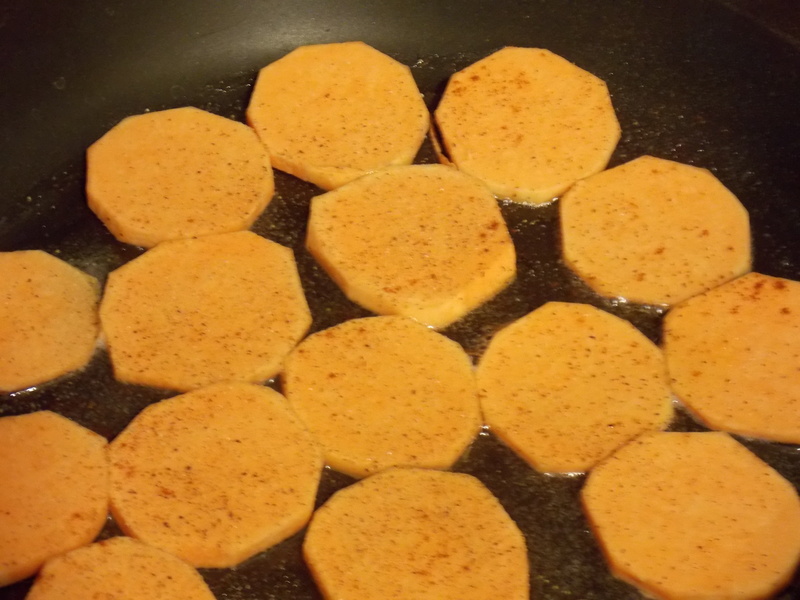 Layer sweet-potatoes into hot oil. Season between each layer. Cover and cook for 10-15 minutes. Place a tray or board over the top of the skillet. Hold skillet and tray together tightly and flip. Remove skillet and place back over low heat. Slide potatoes, now cooked side up, back into the skillet. Continue cooking until bottom in golden brown and all potatoes are tender. Pork and apples is such a classic pairing. It would be so easy to just throw some applesauce on the table on pork chop nights. The problem with that? I HATE applesauce. I’m not sure why, really. I just do. 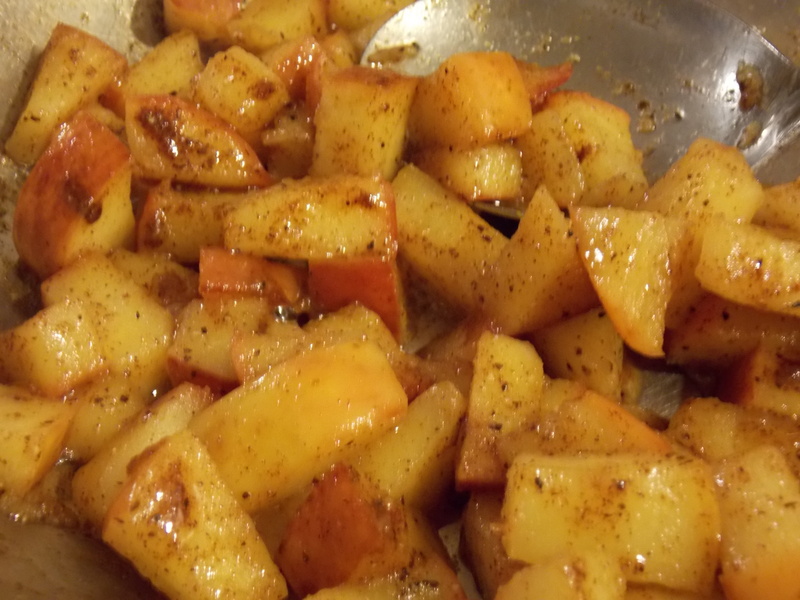 But who knows, I I liked applesauce, I may have never started making this fantastic apple chutney to serve with my pork chops. And then I would really be missing out. Dice up one apple and put it in a small saute pan with butter. Cook until the apple starts to soften. The color will change slightly. Then, carefully add in the secret ingredient – honey whiskey. And the vinegar and spices. 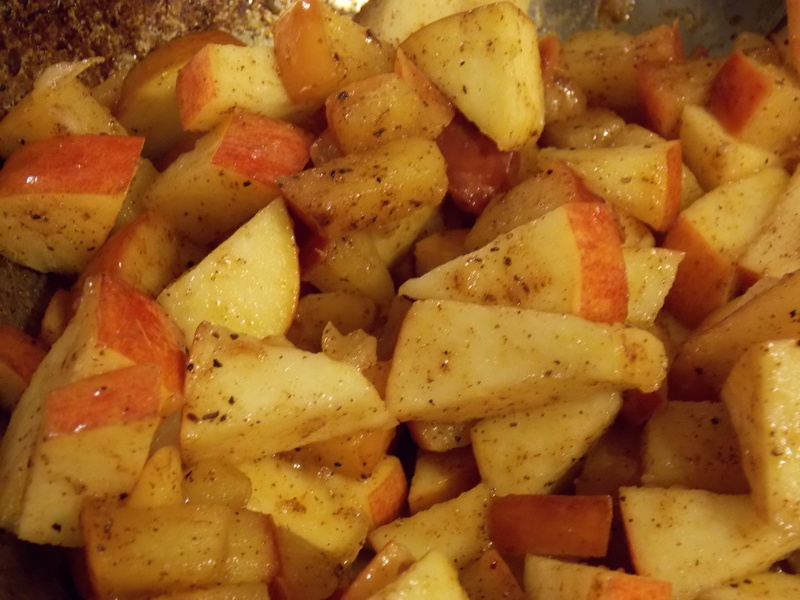 Cook until most of the liquid has evaporated and apples are soft. Stir in a second diced apple. You’re not going to cook this one. The texture contrast is part of what makes this so special. I like to serve this with pork (or chicken) and a green veggie. My kids are partial to broccoli, but really any green would work. The slight bitterness is a nice contrast to the sweet apples. Also, the recipe calls for cinnamon and ginger, but you could spice these any way you like. I find a little cayenne is fantastic. 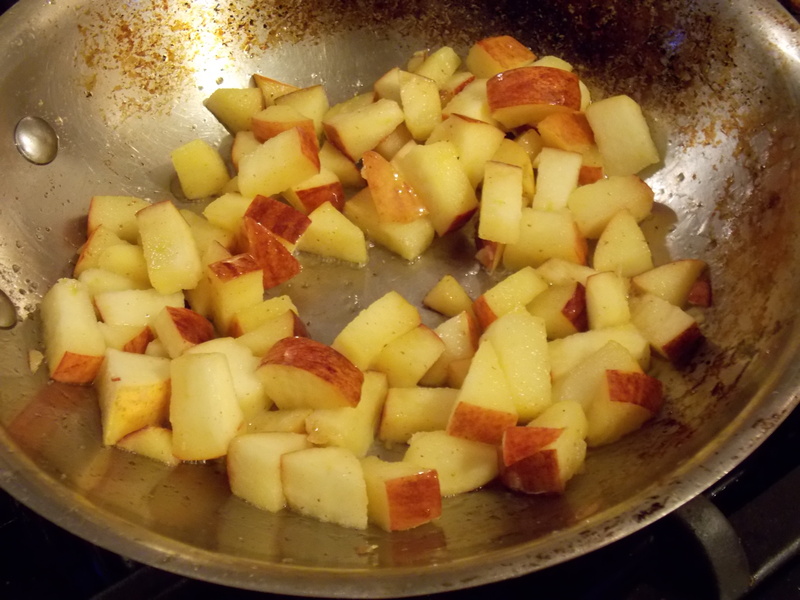 Add butter and half of diced apple to a small saute pan and cook over medium heat until apples just start to get tender. Carefully add whiskey, vinegar and spices. Continue cooking until apples are soft and almost all liquid has evaporated. Remove from heat and stir in the remaining apple. Two summers ago, I went with my husband on a work trip. I had the boys and no car, so we walked from the hotel to the closest burger joint. It was a place I’d never heard of, but it was close and I was starving. I had no idea that walking through that door would change my life. Eating here ruined me for fast food burgers and fries. Much to my dismay (but good for my pants size), the closest one of these to my home is 3 hours away. So, I had a dilemma. I craved those fries. I wanted them so badly so often that I honestly, more than once, considered loading up the kids and driving a 6 hour round trip just so I could get them. I opted for the more practical solution. 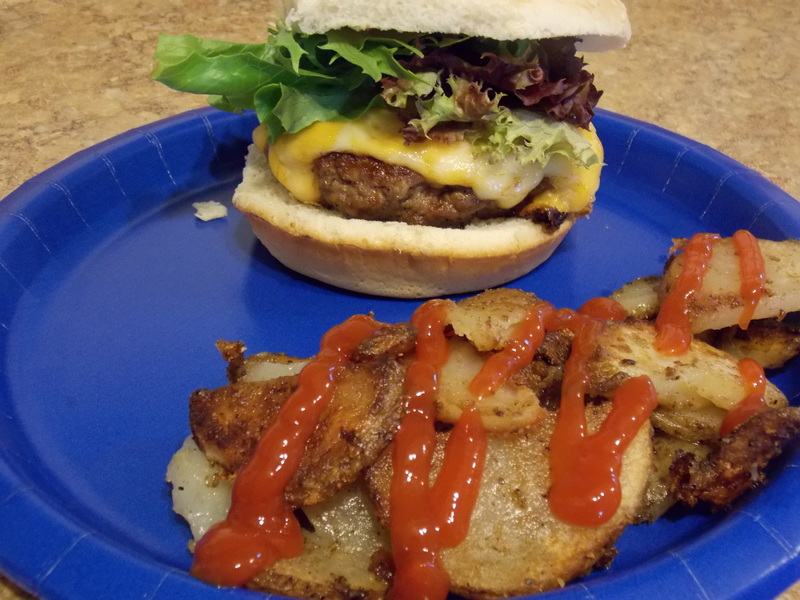 I figured out a way to make fries a home that were just as good (or at least really, really close). Sure there are several steps and they take some time, but it is still less than 6 hours and considerably less trouble than driving 6 hours with my kids. Start by mixing up some salt water and have it waiting. Wash and peel two large russet potatoes. Slice them into thin fries, trying to get them all close to the same size. 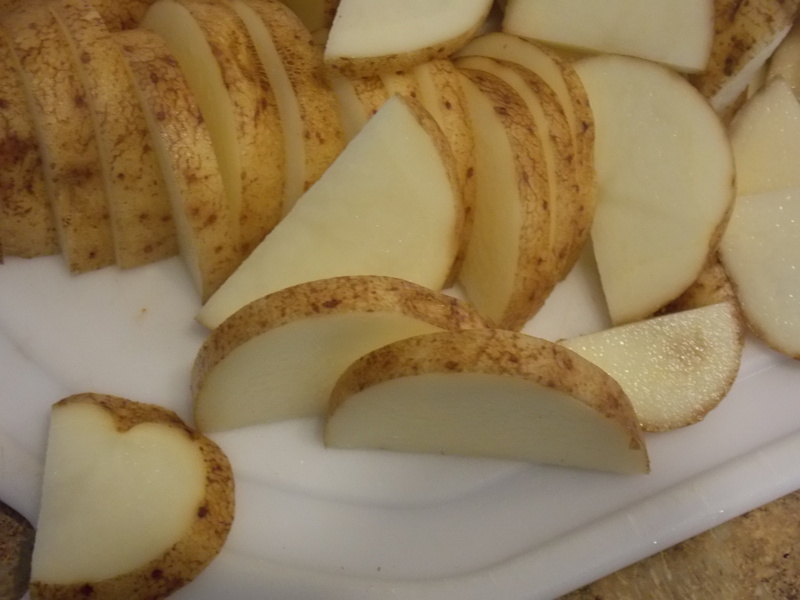 Put your cut fries into the salt water, add enough cold water to completely cover all the potatoes, and let them soak for an hour or two. When you take them out, they’ll be slightly soft and already tasty. Don’t rinse them, but do pat them dry while your oil is heating. Only heat your oil to 300*. You’re going to fry these twice. For the first fry, fry small batches at 300* for 2-3 minutes. 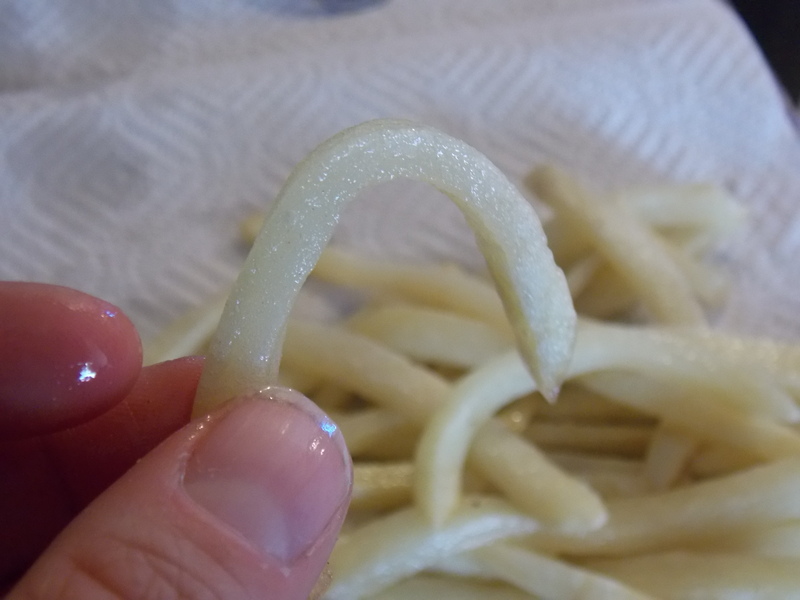 Fries should be soft and pliable and bend when you pick them up. Fries can sit this way, covered and refrigerated, until just before you are ready to serve. You can also freeze them to use on a different day. When you’re ready to eat them, heat your oil to 350* and fry 3-5 minutes or until crispy and golden brown. While still hot, sprinkle liberally with your favorite season salt. This is the only picture of these because they never made it to a plate. Mix together salt and hot water and set aside. Wash and peel potatoes. Slice into several 1/4″ slices (or thinner if you like). 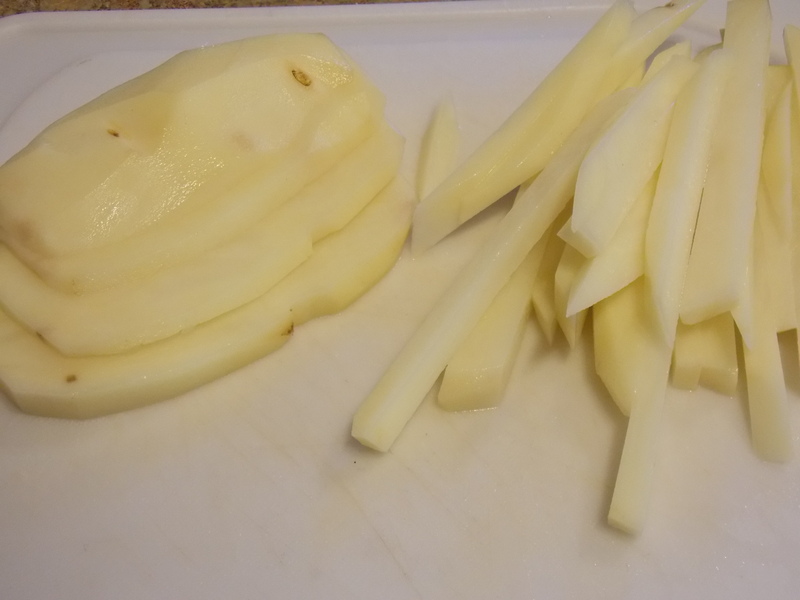 Turn slices flat and cut fries 1/4″ wide. Place cup fries into salt water and add enough cold water to cover all the fries. Let soak for 1-2 hours. Heat 2″ of oil in a heavy pan to 300* (or use a deep fryer if you have one). 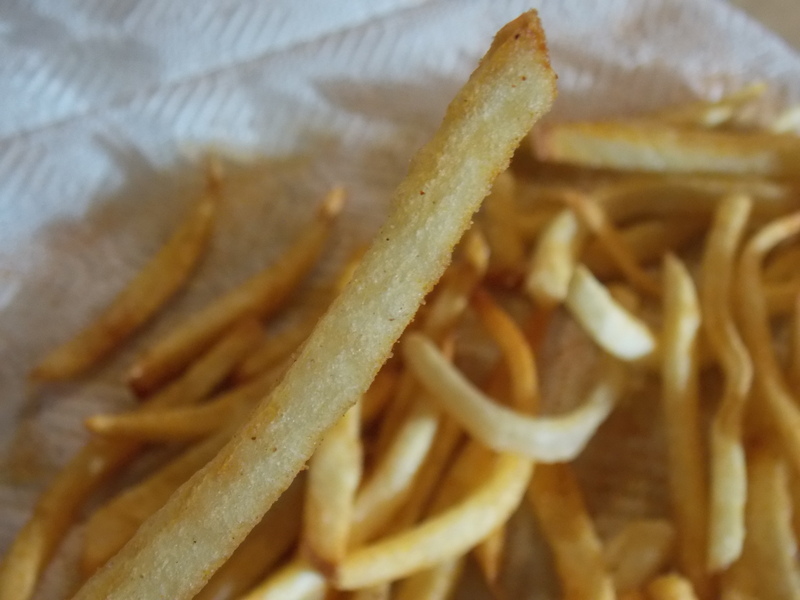 While oil is heating, remove cut fries from saltwater and pat dry. 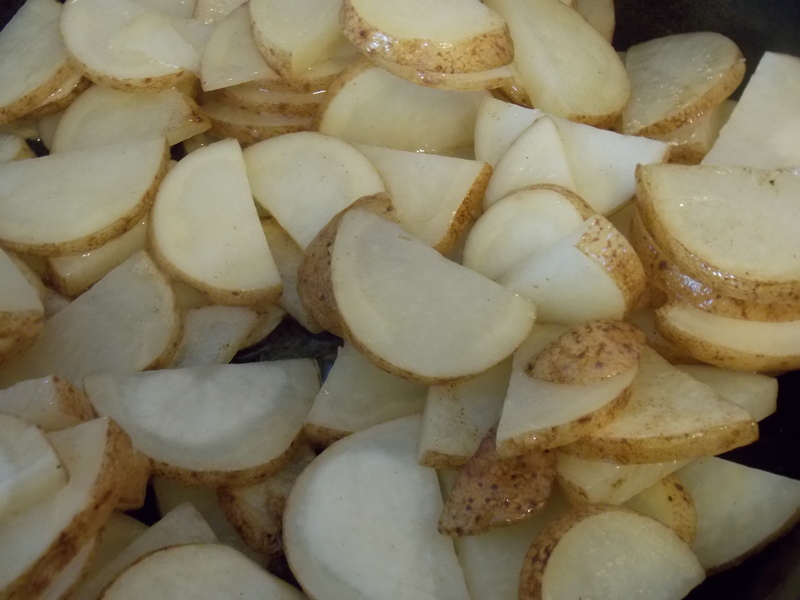 Fry in small batches for 2-3 minutes or until potatoes are tender but not colored. Drain. Turn heat up and let oil heat to 350*. Fry a second time for 4-5 minutes or until golden brown and crisp. Drain. Season with seasoned salt while hot. I love this side dish. Honestly, it is hearty enough to be used as a main dish on a meatless night. It is packed full of flavor and nutrition. Healthy proteins, vitamins, fiber. And, it tastes absolutely fabulous. My 3 year old (the picky one) had 2 full servings and has asked for it every night since I made it. There is nothing that brings a smile to a mama’s face like seeing her boy pick out the kale so he can eat it alone and then asking for more. If you think healthy food has to taste bad, try this recipe. Seriously, it will change your life. If you don’t have lentils already prepared, start them first. Just simmer them in water until they are tender. Cube up your butternut squash. You need about 2 cups of cubes. I used one small butternut squash. If all you can get are big ones, they freeze well. Heat up some olive oil in a large pan and add the squash cubes. Cook until mostly tender and browned. 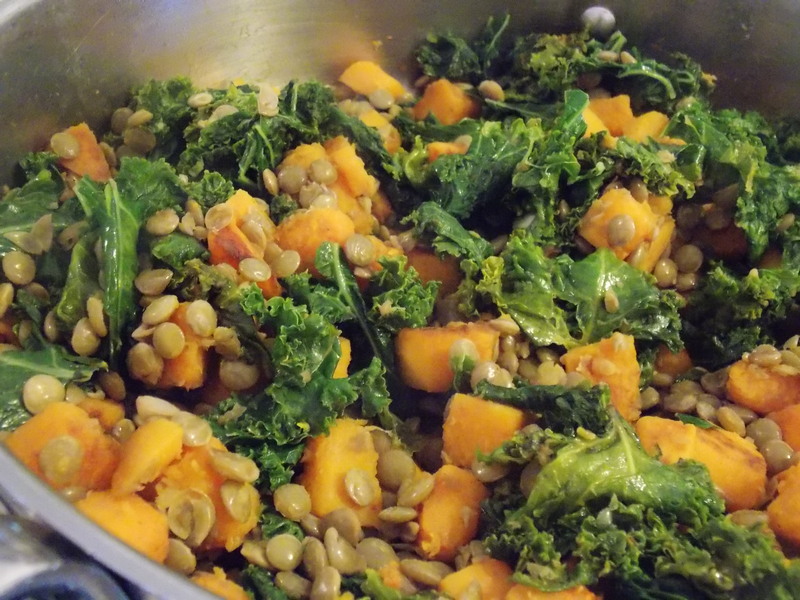 While the squash is cooking down, get the kale ready. Be sure to remove the stems as they are woody and tough. Then just roughly chop the leaves. Remember that greens cook down a lot, so don’t worry about getting the pieces too small. Stir the lentils and garlic into the squash cubes. Deglaze the pan with a little water, stock or wine. Top with chopped kale and put a lid on it. It is going to look like you have way too much kale, I promise, you don’t. Let this cook covered over low heat for 5 minutes. Then, remove the lid and stir. Cook until the kale is as tender as you like it. Serve alone or with a protein. We had salmon and it was delicious. Heat oil in large skillet. Add cubed squash. Cook, stirring occasionally, until browned and mostly tender. 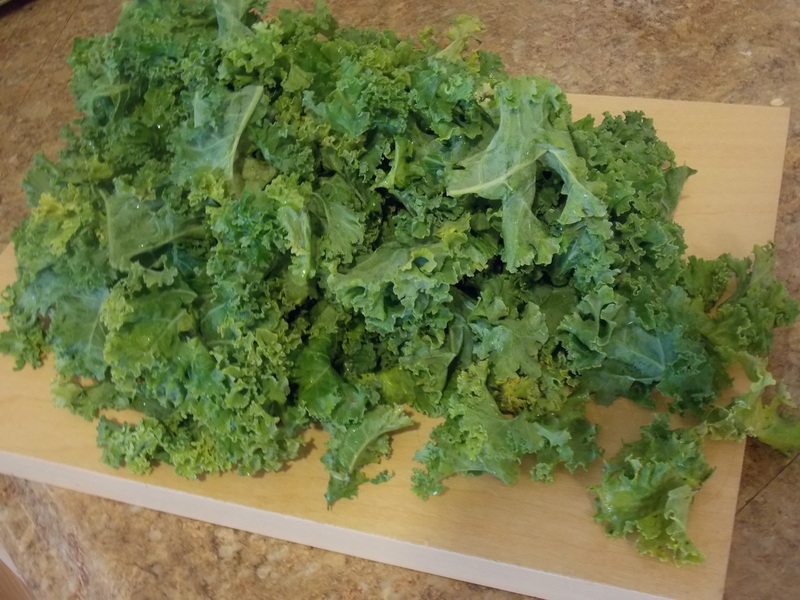 While squash is cooking, remove stems from kale. Rough chop the leaves. Add prepared lentils and smashed garlic to the browned squash. Deglaze pan with water. Add kale and cover immediately. Cook covered over low heat for 5 minutes. Remove lid and stir. 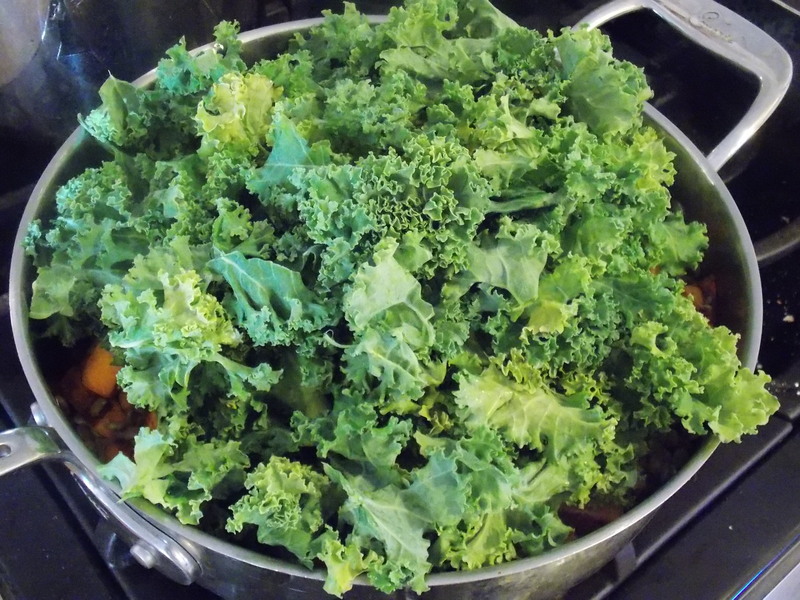 Continue cooking until kale is as tender as you like (2-3 minutes for me). Pomegranate isn’t in season for very long. There’s just something about feeling those tart seeds pop in my mouth that takes me back. Maybe it was only a thing in my small town, but in middle school, pomegranates were all the rage. Seemed like you were only cool if your fingers were stained red from trying to free those tasty jewels from their tightly packed homes. Who knew that by the time I was an adult people would be touting this precious fruit for a myriad of health benefits? But I digress. This super healthy, seasonal side is also tasty and can be served hot, room temperature or cold. Because my rinsing/toasting process takes a while, I usually do this the morning of the day I plan to make quinoa. Start by rinsing the quinoa. This helps get rid of some of the bitterness. Then, toast it. I find it very hard to toast wet quinoa on the stovetop, so I toast it in the oven. I set my oven at 200* and let it go until the color is nice and the seed is fragrant. Takes about 2 hours, stirring every 30 minutes or so. 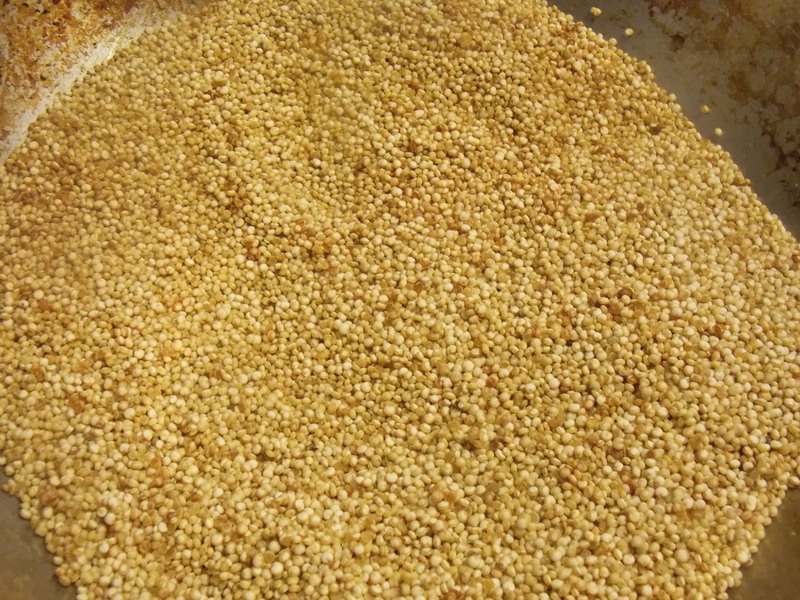 Simmer the toasted quinoa in a mix of broth and water until tender. I used half broth/half water because I like what some chicken broth does to the quinoa, but don’t want to overpower this dish with a brothy flavor. You could use all broth or all water and be just fine. When the quinoa is tender, put half of your diced apple on top and put the lid back on for about 10 minutes. This is going to give some of your apple a nice soft texture while keeping some crisp. 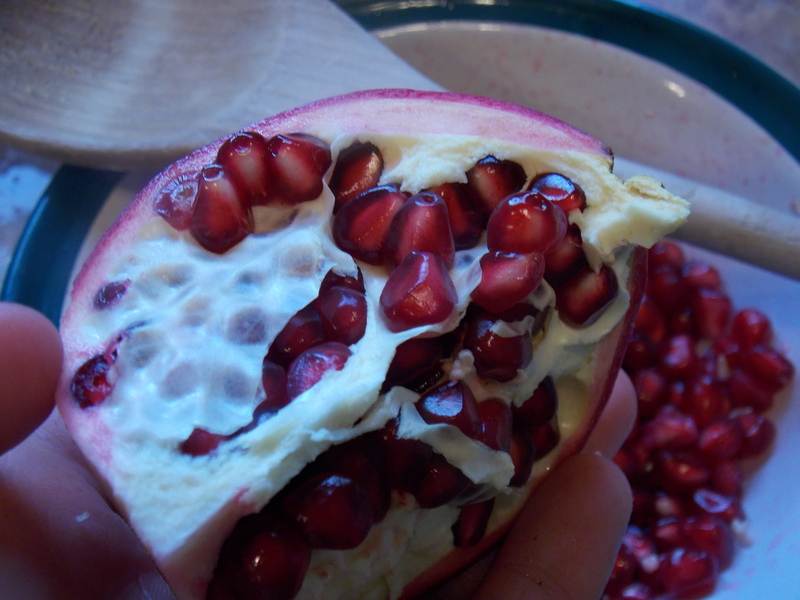 While that is sitting, remove the seeds from your pomegranate. Start by removing the crown and scoring the skin in quarters. 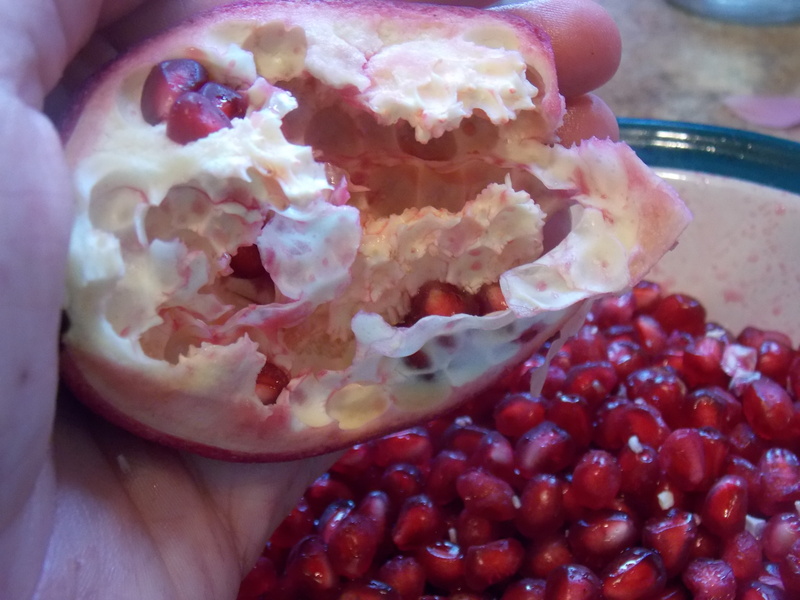 This should allow you to pull the pomegranate into quarters without cutting any of the seeds. The quarters will look something like this. Hold the pomegranate seed side down over a bowl. Use a wooden spoon to whack the pomegranate. This will cause the seeds to fall out. Much cleaner and quicker that picking them out by hand. You may have a couple of stubborn seeds left in the skin. Just gently remove those with your fingers. 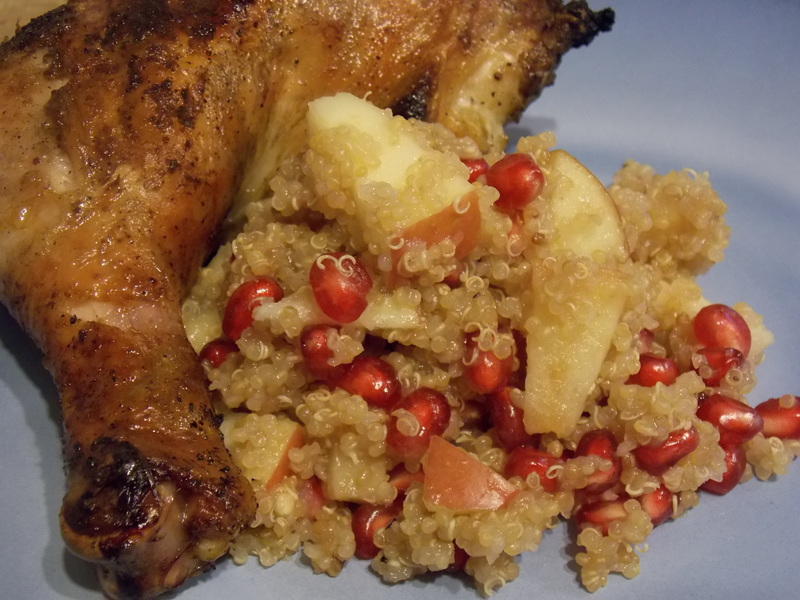 Stir the other half of the apples and the pomegranate seeds into the quinoa. Season with salt and pepper and serve. Add quinoa, broth and water to a small pot. Heat until boiling. Reduce heat, cover and simmer 20 minutes or until quinoa is tender. Add half the diced apple to the quinoa and replace the lid. Let stand for 10 minutes. Stir in the remaining apple and the pomegranate. Season with salt and pepper. Something a bit lighter today. Really, this method works well for any hard winter squash. I use it for butternut squash and even spaghetti squash (when I want that roasted flavor and have the time to skip the microwave). Very simple, but versatile and delicious. 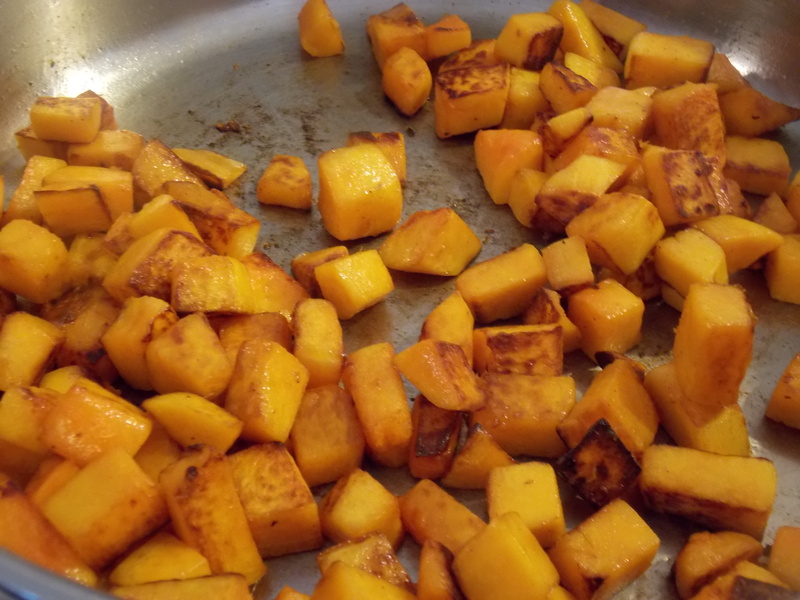 Roasted squash is great is soups and sauces too, so roast up some extra and save it for later. 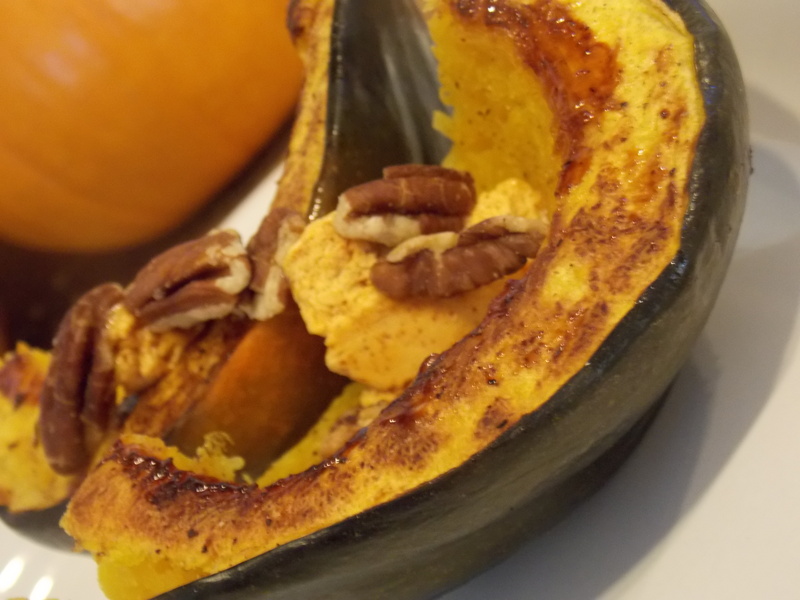 I’ll share my favorite way to use leftover acorn squash later this week. Start by using a sharp knife to cut your acorn squash down the middle. Then use a spoon to scoop out the seeds. Rub the flesh with oil and sprinkle with salt and pepper. 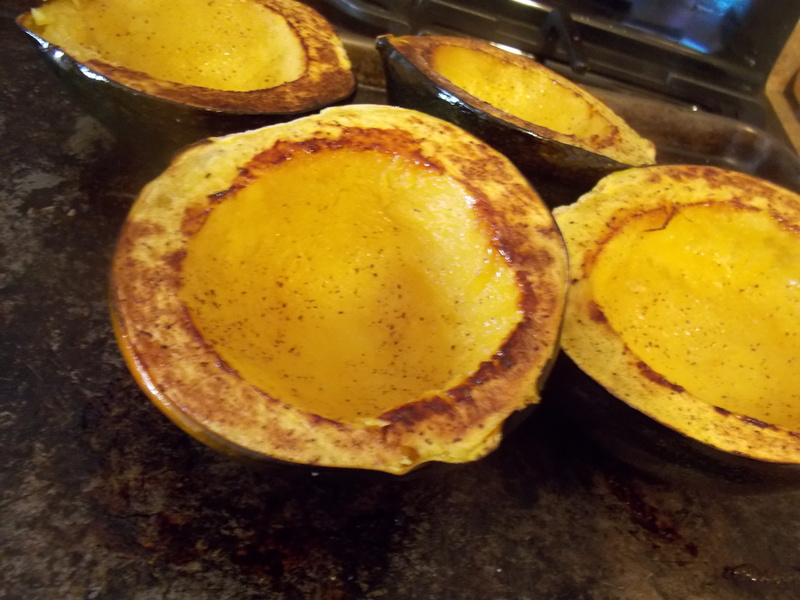 Place squash cut side down on a baking sheet and bake in a preheated oven. When you pull it out, the squash will be browned on the edges (and it will smell divine). I like to cut the halves in half for service, but you don’t have to. Put a dollop of Red Chile Honey Butter and some toasted pecans on top. 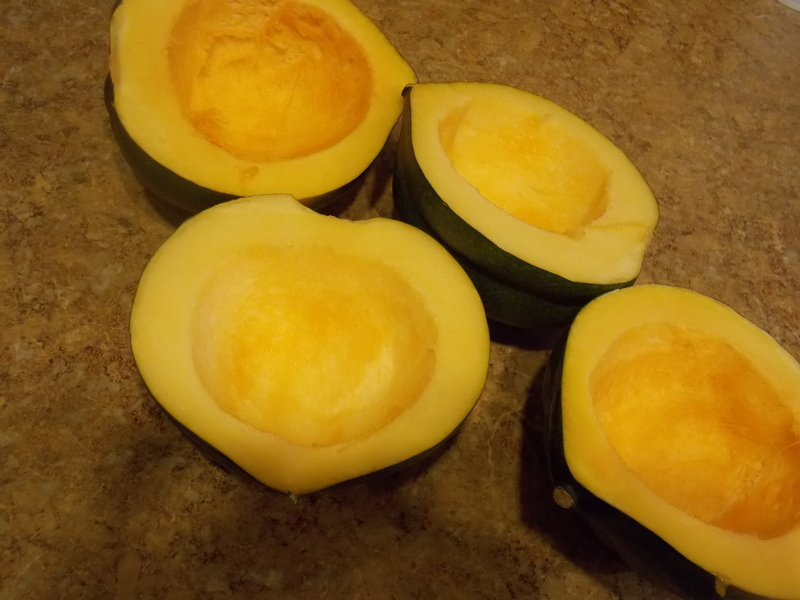 Using a sharp knife, carefully slice acorn squash in half. Use a spoon to remove seeds. Rub flesh of squash with olive oil (about 1/4 teaspoon per half). Season with salt and pepper. Place squash cut side down on a baking sheet. Bake for 25-30 minutes or until squash is tender. Serve with butter and toasted pecans. Since my doctor and I changed my diet about a year ago, one of the things I miss the most is white potatoes. Mashed potatoes, fried potatoes, potatoes in my soups, baked potatoes, potato pancakes, hash browns. You get the idea. I still have them sometimes, but there used to be a potato on the plate 5/7 nights at my house. Not anymore. The good news is, it has led me to try and enjoy lots of different foods. One of those is spaghetti squash. Now, I can’t get behind using it as spaghetti. I know a lot of people do, but the texture just doesn’t work for me. These pancakes, however, remind me of potato pancakes. They have a similar mouth feel, are loaded with flavor and don’t leave you feeling as weighted down as potatoes do. Start by “roasting” your spaghetti squash.There is a time and a place for oven roasting squashes of all kinds. It just isn’t necessary for this recipe. 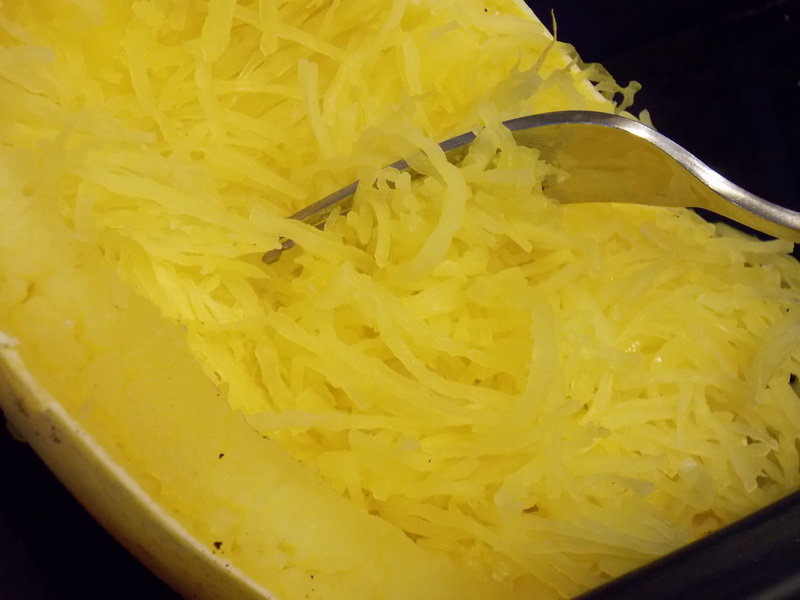 I found a shortcut on the web somewhere and it is how I do spaghetti squash almost every time. Carefully cut your squash in half lengthwise. Scoop out the seeds. Fill the cavity in one half with water and then put the other half back on top (so it looks like a whole squash again). Place this in a microwave safe dish and microwave on high for about 10 minutes (or until the squash is tender). The flesh should pull away from the skin in strings when you drag a fork across it. 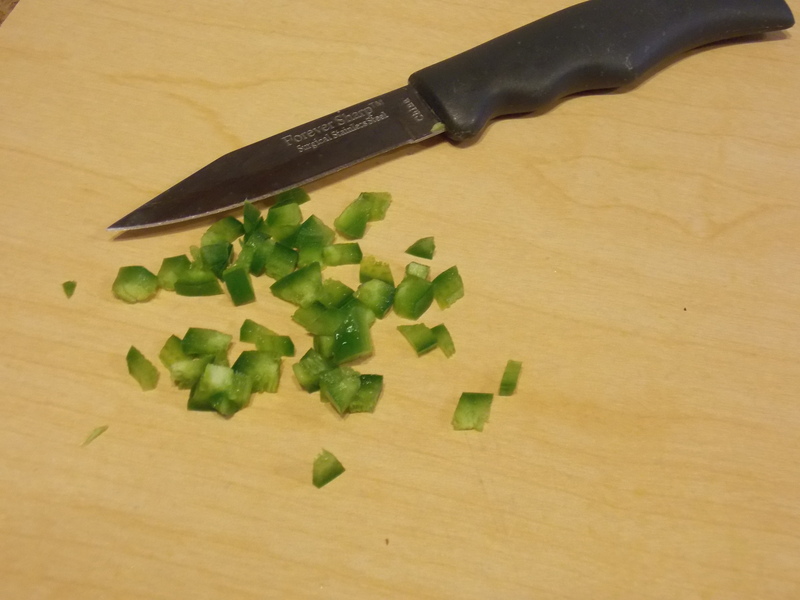 Remove the seeds and ribs from a jalapeno and finely dice it. I used half a jalapeno. The peppers I can find around here are HUGE and, since I was feeding these to my kids, I wanted to keep the heat level down. Feel free to adjust this to your taste. The paring knife is in the picture for a size comparison. Stir together the squash, jalapeno, cheese, egg, flour, salt and pepper. Drop by spoonfuls into a hot non-stick pan with oil. Cook until golden brown and flip. If you’re watching your dairy intake, you can certainly leave the cheese out of these and they still turn out wonderful. Remove the ribs and seeds from jalapeno. Dice finely. Stir together spaghetti squash, jalapeno, cheese, eggs and flour. Season with salt and pepper. Drop mixture by spoonfuls into hot oil. Cook for 2-3 minutes per side or until golden brown. Serve warm. Sometimes you just want something simple and comforting. Something that reminds you of eating with family. Something that tastes good, but screams homemade, unrefined. That’s how I feel about fried potatoes. Truth is, I make good French fries. I peel the potatoes. Cut them into thin, almost even fries by hand. I rinse them in cold water. I blanch them in hot oil. I fry them a second time in hotter oil so they are golden and super crispy on the outside and tender and fluffy on the outside. But, sometimes I just crave these much simpler pan fried potatoes – and my family loves them just as much (or maybe even more) than my time and labor intensive fries. Start by washing your potatoes really good. I use a scrub brush. Then, cut them in half long ways. Cut those halves into 1/8-1/4″ thick half rounds. 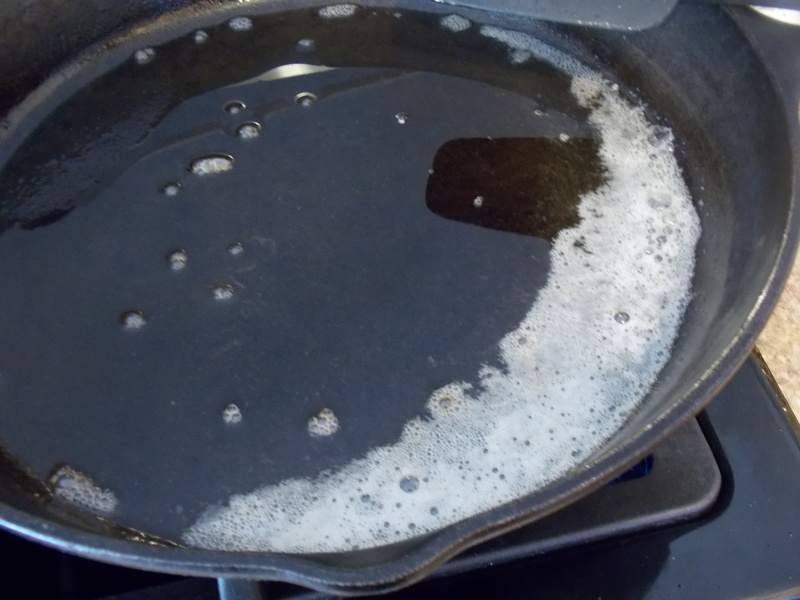 Place a heavy skillet over medium low heat and add enough oil to cover the bottom of the pan. When the oil is hot, add a tablespoon of butter just for flavor. When it melts and gets foamy, the pan is ready for your potatoes. If you’ve got bacon grease hanging out somewhere, feel free to fry up your potatoes in it. Add your potatoes to the skillet. You’ll notice I over crowded my skillet. The food police may come kill me, but I hate washing dishes. Would these cook more quickly and be more evenly crispy if I’d used a couple different skillets or fried in batches – sure. And I MIGHT have done that if I was cooking for company. I wasn’t though, and I want you all to realize that you don’t have to make food that looks perfect and follows every rule for it to taste fantastic. Cover them up and cook them for about 10 minutes. You should be able to see that the centers are still raw and the edges are starting to cook. Season, stir and cover again. When the centers are almost totally done, take the lid off and turn the heat up to crisp the outsides. Taste for seasoning and serve. It’s important to taste. Start with the lowest seasoning measurement and add a little at a time until they taste just right for you. Also, if you’d prefer fresh, diced onion over the onion powder, go for it. These are equally delicious either way. I could eat these straight from the skillet, but I have to admit, I do like them on the plate with some ketchup. Wash potatoes well. Slice in half lengthwise and then slice halves into 1/8-1/4″ slices. Heat oil in a heavy skillet over medium low heat. When oil is hot, add butter. Butter will melt and foam. Add potatoes. Cover and cook for 10 minutes. Season with 1 teaspoon salt, 1/2 teaspoon onion powder and 1/2 teaspoon black pepper. Cover and cook until potatoes are tender. Remove lid and turn heat up. 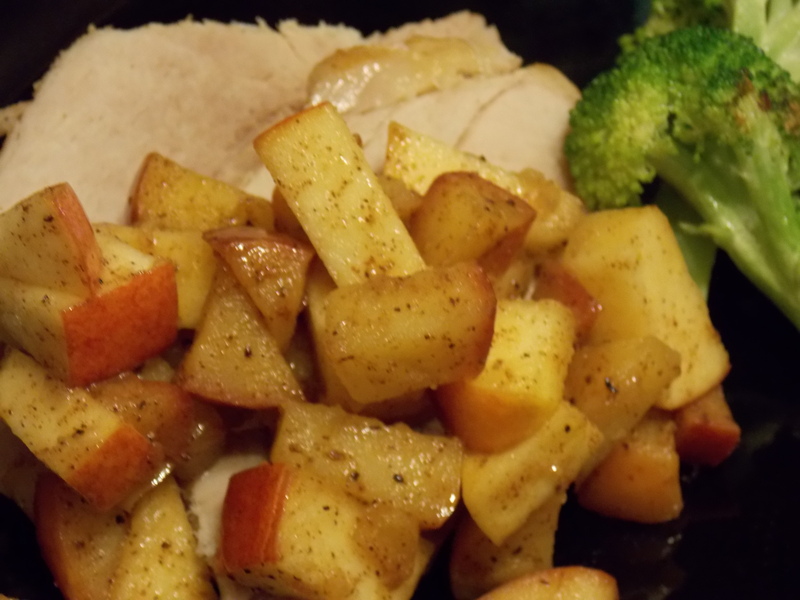 Cook until potatoes are brown and crispy. Taste for seasoning adding more if necessary.